When Abraham Lincoln embraced the end of slavery, he transformed a domestic civil war into a struggle for the soul of humanity. With this transformation, he now presided over America's first war of humanitarian intervention, with a crusading, explicitly religious moralism at its core. The Huffington Post Canada is proud to be a returning sponsor of the prestigious Charles Taylor Prize for Literary Non-Fiction. In the weeks leading up to the March 4 announcement of this year's prize winner, we are publishing excerpts from each of the five finalists. The authors have personally chosen the portions they'd like to share, and each excerpt begins with a brief explanation of why that particular passage was chosen. Strange as it may sound, this book began on a whim. In the preface, I locate its origins in an undergraduate seminar during my first year of university teaching. I was young, fresh off completing my PhD dissertation on the Vietnam War, and was looking for a new project. When my students asked me some tough questions about the role of religion in U.S. foreign policy, I didn't have any good answers; and when I couldn't find any answers in the library, I thought I'd found that elusive next book. And indeed I had. But I didn't realize how difficult it would prove to be. Some of this had to do with the scale of the book, stretching as it does over four hundred years, from the late sixteenth-century up to the early twenty-first. Some of it also had to do with the vast literatures on the histories of American religion and U.S. foreign relations that I had to plow through. But really, the greatest difficulty was simply not knowing how I was going to deal with some of the major episodes in American history. My book promised to find the missing religious link to the otherwise familiar history of American war and diplomacy. But what if there was no link for episodes or figures I couldn't possibly avoid? What would I do then? This was a real problem. According to most historians, several of the major figures in my book weren't religious. Franklin D. Roosevelt is supposed to be one of them, a man for whom the church was little more than mere cultural heritage. Yet once I got into the original historical records, it became immediately clear that religion was a central part of who FDR was, and how he approached politics and foreign policy. Thankfully, most historians before me had missed this angle. Abraham Lincoln posed a similar problem, but he proved to be even trickier. No history of the United States can avoid this most revered of presidents. Yet Lincoln, say most historians and biographers, wasn't the least bit interested in religion, and he supposedly locked religious values and politics outside the White House gates. To make matters worse, there's no obvious link between the Civil War and American diplomatic history. Yet I couldn't just skip the man or the moment. They're just too important. Luckily for me, when it came to religion Lincoln turned out to be one of the most interesting figures in American history. Reinhold Niebuhr, another giant who stalks the pages of several chapters of my book, even called Lincoln "the greatest theologian" of the Civil War era--no small accolade given the widespread evangelical intensity of the 1850s and '60s. It's true that despite coming from a hard-core Baptist household, Lincoln wasn't a very religious man before becoming president. But from his hard-shell Baptist and Calvinist upbringing, he retained certain religious ideas, foremost among them a faith in providence. Most previous historians had simply chalked that up to a more generic sense of destiny or fate. But Lincoln was always clear: God had a plan for this world. Not unrelated, Lincoln believed, more specifically, that God had a plan for him. Anyone who runs for president has the ability to blend an enormous ego with an innate political pragmatism, but nobody struck this balance better than Abraham Lincoln. Lincoln's faith grew during the war. How could it not, given the moral stakes involved and the mass slaughter that resulted? He never recaptured his childhood evangelicalism. Instead, he blended several currents of Christian thought to form a uniquely but typically Lincolnian compromise: a general religion, a civil religion, that could appeal to all Americans and help explain the war to them. As Lincoln's faith evolved, so too did his views on slavery. He had never liked slavery, but preserving the Union was his priority, and he began the war by promising not to abolish it where it already existed. But beginning with the Emancipation Proclamation and culminating with the Second Inaugural, Lincoln views underwent a profound transformation. Moreover, public opinion in the North mirrored Lincoln's own private views. By 1863, the aims of the prewar abolitionists, who had been reviled as troublemakers in the 1850s, were broadly accepted in Northern political culture. The excerpt I've chosen reflects the ambivalence Lincoln felt about slavery and the transformation he underwent. In the end, I argue, when Lincoln embraced the end of slavery, he transformed a domestic civil war into a struggle for the soul of humanity. With this transformation, he now presided over America's first war of humanitarian intervention, with a crusading, explicitly religious moralism at its core. He envisioned a Union victory in the American Civil War as the first battle in a global struggle for freedom. I've chosen this passage not only because I think it was an important historical moment but because it strikes me as uncannily resonant of our own times. Lincoln reinforced the centrality of emancipation time and again between 1862 and the end of the war. In the process, the war's cause--indeed, its very nature--shifted in his mind from secession to slavery. As he told a group celebrating victory at Gettysburg, "we have a gigantic Rebellion, at the bottom of which is an effort to overthrow the principle that all men are created equal." In 1864, when Congress turned to drafting what would become the Thirteenth Amendment to abolish slavery once and for all, Lincoln supported it enthusiastically and pressured wavering members of Congress to do the same. To Lincoln, the war was simply God's plan to bring about justice on earth. "We hoped for a happy termination of this terrible war long before this; but God knows best and has ruled otherwise," he told the Quaker activist Eliza Gurney a year later. "He intends some great good to follow this mighty convulsion, which no mortal could make, and no mortal could stay." These were not idle words, and it is clear that this period also marked the time of Lincoln's ever-increasing piety. His moral conversion on slavery was mirrored by a spiritual conversion on faith. Religion now formed the heart of both his moral vision and his wartime rhetoric. The apotheosis of Lincoln's public faith came in one his most famous speeches, the Second Inaugural Address of March 1865. The explicit religiosity of the Second Inaugural marked something of a departure for Lincoln, whose speeches were embedded in religious phrasing but did not normally appropriate religious doctrine for their content. Yet this departure was also a culmination, mainly of Lincoln's own struggle to sort out the true meaning of the war. Frederick Douglass, among the audience who heard the speech, said that it was "a sacred effort" that "sounded more like a sermon than a state paper." Philip Schaff, one of the nation's leading theologians, pronounced that no "royal, princely, or republican state document of recent times can be compared to this inaugural address for genuine Christian wisdom and gentleness." Observes the historian Mark Noll, "none of America's respected religious leaders...mustered the theological power so economically expressed in Lincoln's Second Inaugural." Or, as another historian put it, the Second Inaugural was Lincoln's Sermon on the Mount. If we shall suppose that American slavery is one of those offenses which, in the providence of God, must needs come, but which, having continued through His appointed time, He now wills to remove, and that He gives to both North and South this terrible war as the woe due to those by whom the offense came, shall we discern therein any departure from those divine attributes which the believers in a living God always ascribe to Him? In the end, only emancipation, even more than Union, would cleanse the nation's soul. "Fondly do we hope, fervently do we pray, that this mighty scourge of war may speedily pass away," Lincoln declared in one of the speech's more memorable passages. "Yet, if God wills that it continue until all the wealth piled by the bondsman's two hundred and fifty years of unrequited toil shall be sunk, and until every drop of blood drawn with the lash shall be paid by another drawn with the sword, as was said three thousand years ago, so still it must be said 'the judgments of the Lord are true and righteous altogether.'" Once a war for national unity, Lincoln had rechristened the Civil War as a struggle for liberation. Through presidential rhetoric and military victory, the moral radicalism of the abolitionists had been vindicated. 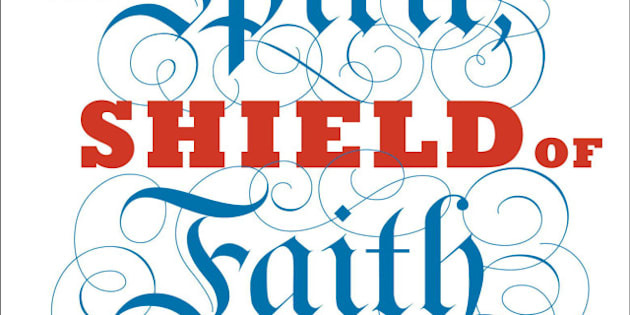 Excerpted from Sword of the Spirit, Shield of Faith: Religion in American War and Diplomacy. Copyright © 2012 Andrew Preston. Published by Knopf Canada, an imprint of the Knopf Random Canada Publishing Group, which is a division of Random House of Canada Limited. Reproduced by arrangement with the Publisher. All rights reserved.